That’s always the first thought whenever this happens, right—shouldn’t there be video? Well, this time there is. Maybe. The Auburn Police Division is asking for the public’s help in identifying the two people shown in the attached video clip and photo. 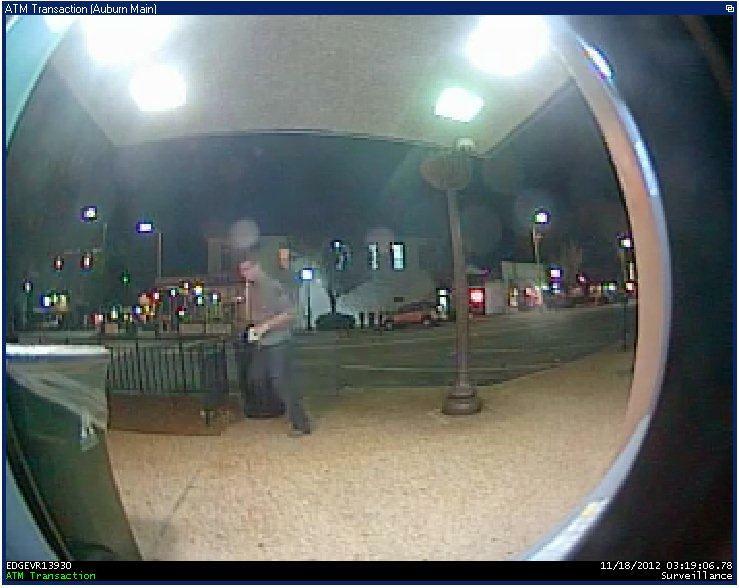 They are persons of interest in the Toomer’s Corner oak trees fire that occurred at approximately 3:20 a.m. Sunday, November 18, 2012. Both appear to be wearing dark colored pants and light colored shirts. Anyone with information regarding the fire or the identity of the persons shown in the video and photo is asked to call the Auburn Police Division at (334) 501-3140 or anonymously by text or voice on the tip line at (334) 246-1391. As we rebuild the Corner we need consider some irrigation or self flushing trees. We can say it’s for clean up but the real value may be in saving lives from a fire on a night like the National Championship celebration. That appears to be the camera for Compass bank’s ATM. Not exactly a web can. The video is from the webcam.